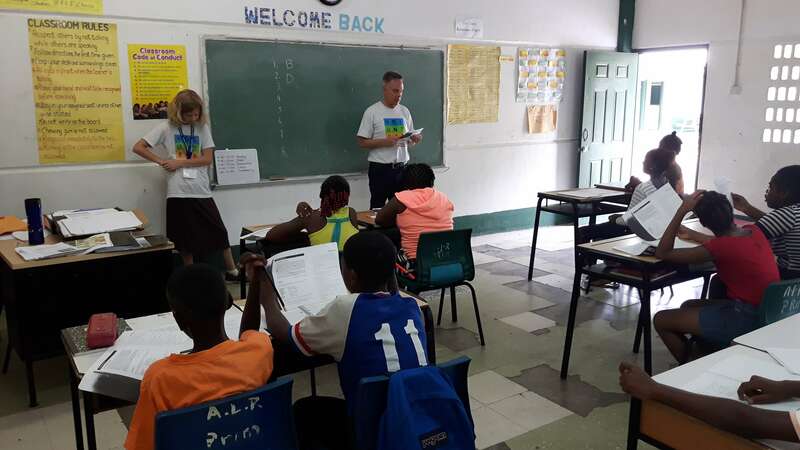 St. Lucia Volunteer Erin C. discovers teaching children in a St. Lucia classroom requires patience – and a measure of “blind faith.” Short-term volunteers teach children ages 10 to 17 at the Anse la Raye Primary School. Leigh and Raymond teach children during summer school. We woke to the sound of rain on the tin roofs today. I laid in bed listening to the torrential downpour, wondering if it would let up — and if the students would still be coming to the school on such a rainy day. At morning meeting, Chem explained that the possibility of flooding in the village could indeed keep the kids at home. By the time we finished the meeting and gathered at the van, the rain had mostly subsided — but I think we all were going on a bit of blind faith that we would be teaching children today. Emma teaches children at Anse la Raye Primary School. Slowly, but surely, the children began arriving at their classrooms and the teaching began. Overall attendance was nearly at the same rate as Monday. The students seemed more attentive today than the day before. 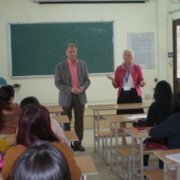 And many of the volunteers agreed they felt a bit more prepared and confident on our second day teaching the children. So we’re moving in the right direction! The students seem to be warming up to us strangers as teachers. Many of them — mostly the girls — lingered in the classrooms talking with the teachers during break and lunch. We missed Sally and Manel at the school today. They were off on their St. Lucian adventure at the volcano, botanic gardens, and mud baths.